Fallout 76 is a significant departure from a lot of what we think of as Fallout fundamentals, but even without written NPCs, the game will feature factions – and Bethesda revealed one of those Friday. In a tweet to the Fallout account, Bethesda introduced a faction called the Responders – a group of emergency services personnel who linked up after the nuclear holocaust that incinerated and reshaped the world and created the blasted wasteland we know as Fallout. 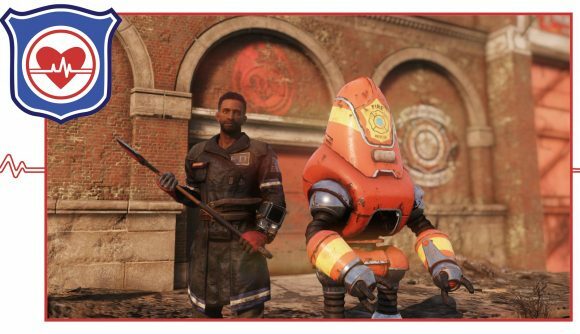 Not “help anyone in need” or “help those who find themselves in the worst of circumstances.” No, it’s “help each other.” The image shows a man in a firefighter’s protective coat wielding an axe, next to a brightly-painted Protectron unit. Both wear insignia that indicates they’re part of a fire fighting and rescue unit. It’s not exactly clear how factions will work in a game that doesn’t have Bethesda’s traditional NPCs in it – Fallout 76 is experimenting with the idea of having other real humans play those parts. So it goes without saying that factions clearly won’t work the way they have in previous games. Instead, it’s possible that the Responders is a group you can either join in the game, or perhaps align yourself with when you create your character. The Responders aren’t the first Fallout 76 faction to be revealed, of course – fans have found traces of the Brotherhood of Steel, and Bethesda recently explained their presence in the game with a bit of a retcon. The Responders is an interesting bit of lore, though – it ties Fallout’s pre-war world together with its scorched present. And there’s something vaguely ominous about the “help each other” line that is reminiscent of The Division’s Cleaners faction. We’ll find out how this all works when Fallout 76 comes out November 14.